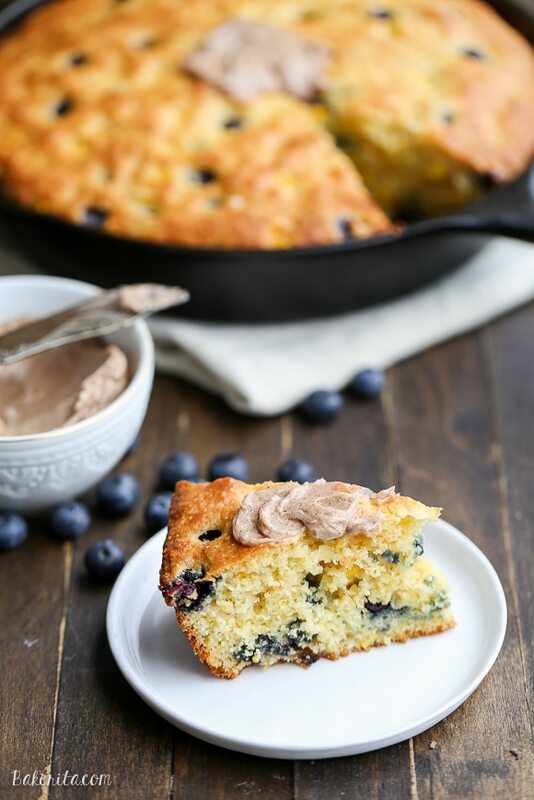 This Blueberry Cornbread is a sweeter take on traditional cornbread with fresh blueberries and sweet corn kernels. It’s baked in a skillet and served with whipped cinnamon honey butter. Hi, I’m back with more cornbread goodness. I know, if you follow the happenings around here, I brought you these green chile corn muffins not too long ago, and here I am with another cornbread recipe for you. But this one is so different from those…I couldn’t help sharing both recipes. Where those muffins are totally delicious, they’re also definitely savory: they get their flavor from green chiles, cheddar cheese, and creamed corn. Yum for sure, but sometimes you want cornbread with a sweet edge. That’s where this blueberry cornbread comes in. It brings cornbread into definite breakfast territory. It would also be a rockin’ snack, or dessert (with vanilla bean ice cream + honey, if you’re smart ). Because flavored butters make anything better, I whipped up a quick honey cinnamon butter to serve with the cornbread. And, uh, make the butter. It takes the blueberry cornbread from great to irresistible, especially if you did yourself the favor of warming the cornbread up a bit before serving. This cornbread recipe is kept soft and moist with Greek yogurt. It’s definitely not overly sweet, but the blueberries help out with that by giving little bursts of flavor and sweetness. I love corn kernels in my cornbread, so I also added whole sweet corn kernels. Paired with the blueberries, they give a homey and delicious twist – I’m also super into the texture they add. Speaking of texture – I baked this in a skillet because I am all about those crispy edges that you can only really get from cast iron. If you’re into softer edges or don’t have a cast iron, just bake in a regular square pan. No sweat! This recipe is super easy and will come together in just a few minutes. It bakes quickly, and it’s even better warm. It also keeps well for a few days. When serving, 15 seconds in the microwave and a slather of cinnamon honey butter do wonders for this blueberry cornbread. Enjoy! Adjust an oven rack to the middle position and heat the oven to 375°F. Grease a 10” cast iron skillet or a 9" square baking pan. Whisk the flour, cornmeal, baking powder, baking soda, and salt together in a large bowl. In a medium bowl, whisk the greek yogurt, sugar, milk, melted butter, and eggs together until smooth. Gently fold the sour cream mixture into the flour mixture with a rubber spatula until just combined. Do not overmix. Fold in the corn kernels and blueberries. Pour the batter into the skillet and smooth the top. Bake until cornbread is golden yellow, about 17-20 minutes. Don’t over bake - you don’t want your cornbread to be dry! Remove from the oven and cool completely. For the cinnamon honey butter, stir together all of the ingredients until fully combined. Serve with cornbread. This cornbread looks SO good, Rachel! Such a great idea to add in blueberries! And I’m drooling over that butter. So perfect! Okay, best idea EVER. 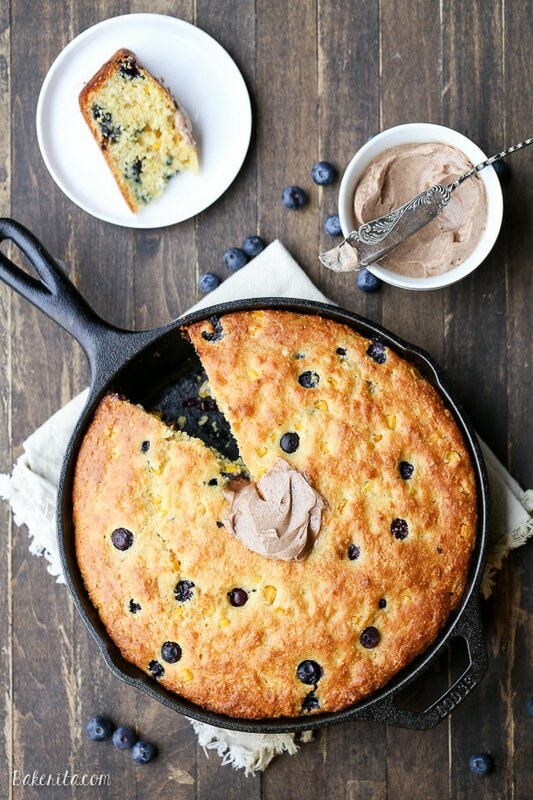 I never would have thought to throw blueberries into my cornbread batter, but I’m seriously glad that you did. I’m a conrbread FREAK so this is so up my alley! Amazing!!! I love baking cornbreads in skillets too! Those crispy edges are to die for! 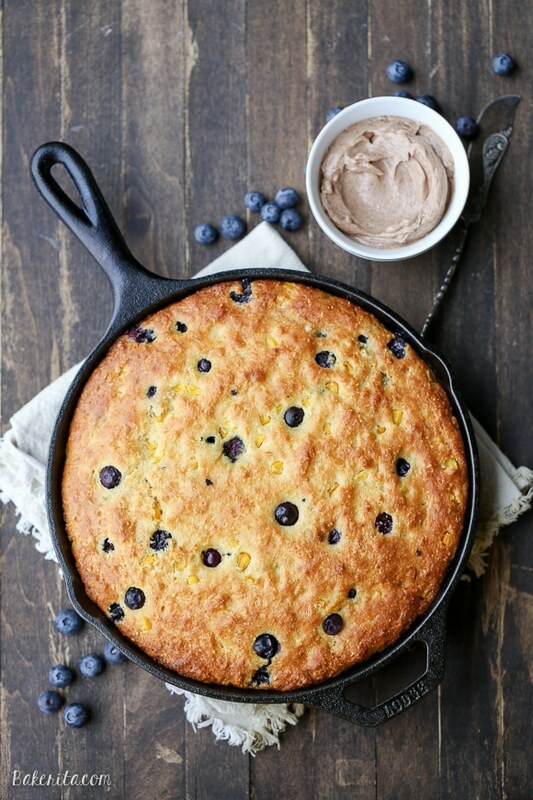 I love cornbread already, and blueberries make all the baked goodies better! What a great idea of adding blueberries, it looks mouthwatering! You’ve got to try it, Claudia! Taste a little piece of America, haha :D thanks, girl! Ummm, YUM! I would have never thought to add blueberries to cornbread. What a perfect combination! Oh my….I was so proud of myself when I added honey to my butter for spreading on my cornbread – but this?! Blueberries?! I love it!!! 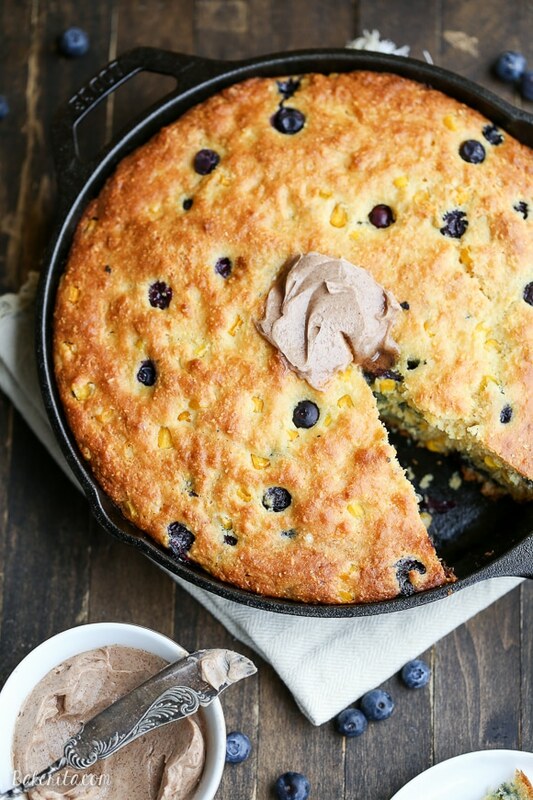 I love sweet cornbread from time to time, but I’ve never thought to add blueberries to it. I’ve got to try this recipe, especially with that cinnamon honey butter! Cornbread isn’t really a ‘thing’ here in Australia (which is a real shame, considering that crumb). In fact, I doubt many people have even heard of it. I’m one of the lucky Australians who have tried it, thanks to being introduced to it through various US food bloggers. Your blueberry version looks totally delicious, Rachel! Yum this looks so good with the blueberries! I absolutely love cornbread and will have to try this! When I saw this post I just wanted to jump up and down yelling, cinnamon honey butter! It’s my WEAKNESS! This cornbread looks PERFECT Rachel! It actually reminds me of an amazing skillet cornbread we had in Washington DC when we were in the states last year. I can’t wait to try it! 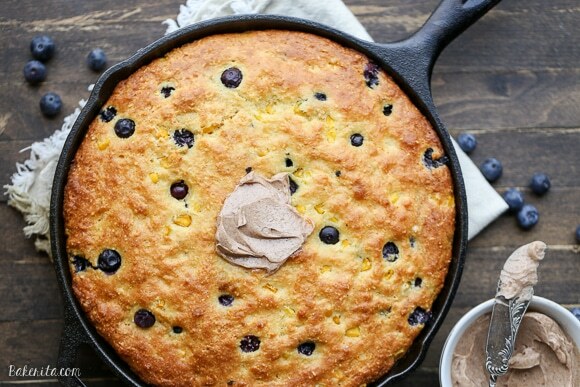 Whoa- Blueberries in cornbread?! AMAZING!!! I would have never thought of that!!! And those photos…!!! I just want to eat it all!!! You can, but make sure to thaw and drain them before using! Hi there, I just made this and it was AMAZING. The only thing I did different was to add 1t cinnamon and 1t ground coriander to the dry ingredients (trust me on ground corriander–it dances with ground cinnamon like Fred Astaire and Ginger Rogers). Anyhoo, I baked it in a cast iron skillet at 375F for 20 minutes, and the center was still quite un-set. I covered it with foil, reduced the temp to 350F and gave it an additional 5 minutes to set…then 5 minutes more…then 5 minutes more…then… In all, the bread required about 20 minutes additional baking time at the reduced temperature. I’ve never had a “slow oven” issue so I’m wodering if anyone else had this bake time/temp issue. PS: I will DEFINITELY make this again! In fact, we are having a big family BBQ this Friday and this will be the dessert! Nom-nom-NOM!!! I just made this to ight because I scored a big flat of fresh blueberries for next to nothing. It’s on my counter cooling as we speak and it smells amazing. I did have the same issue with the timing…it took about 30 minutes altogether. I’m using an 8″ skillet.